My first day of training as a new intern at Medicine Horse wasn’t quite what I expected. In fact, it wasn’t like anything I expected. I’m standing outside a pen of horses, just watching them - because that’s what I was instructed to do as part of the program's horse handler training. Huh?? How in the world am I supposed to learn anything by just looking at a bunch of horses? I had a clear vision of what I wanted out of an internship, although my school warned me that foundation-year students weren’t likely to get work in animal-assisted therapy. Second years were preferred, and in fact, only 2 positions were available to my 200-student cohort. After nearly 30 years of working in corporate America, I just couldn't see myself working in another office and as I told my field advisor, l could not see myself doing anything but animal-assisted therapy. With determination and a great deal of good fortune, I pursued Medicine Horse and they took me on. I was used to the very hands-on and very structured environment of a hippotherapy program, so my expectations for horse handler training weren’t any different than what I’d experienced at the barn in my hometown of Austin, Texas. An enthusiastic learner, I was looking forward to learning MHP’s preferred way of grooming, tacking, mounting, etc. The long commute from Denver and the crazy hours did not deter me; I was beyond thrilled to get such a coveted spot. On my first day, I gleefully jumped out of my car, shook hands with the trainers, and after a brief introduction, went to go meet the herd. So here I was, standing outside a pen where three beautiful horses lazily grazed, paying me no attention. And right of the bat I was asked to...observe them? Um, what??? What kind of place is this? My vision of becoming an EAP-certified therapist began to quickly dissipate. This is really weird, I thought. When do we get to actually work with the horses? We were asked to move slowly around the outside of the pen and observe the horses’ responses. The whole exercise made absolutely no sense to me, but I played along, impatient to get it over with and get on with the actual handling. The horses seemed only slightly interested as another intern and I made our way around the edge of the fence. Finally, one horse, a beautiful paint whom I later learned was named Frankie, sauntered over and after having satisfactorily sniffed me, walked away. When we went into the pen, we just interacted with the horses. Again no leading, no tacking, no nothing. *Sigh* Where are we going with this? What I didn’t realize at the time was that this was the actual work. Herd Observation, which at first seemed like some woo-woo trippy exercise to me has now become my favorite. I knew from experience that it’s impossible to lie to a horse; s/he picks up on everything and mirrors it back to the companion. What I didn’t know was how much herd interaction mimics human interactions and relationships. From client comments, I came to realize how much we project our own stuff onto the horses. 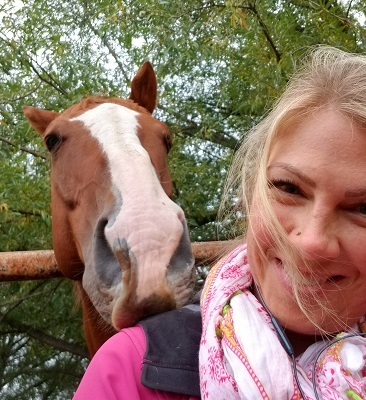 To a therapist-in-training, that's a goldmine of information to explore in EAP: You can tell a lot about a person’s self-image and relational patterns by how s/he interprets a horse’s behavior. “That horse doesn’t like me” is probably the most common descriptor I’ve heard, and most often from teens. I have not yet decided which population(s) I want to work with in mental health, but teens have piqued my interest. Probably because I find working with them so challenging. Questions like How do I reach these kids? How do I connect with them? have been the subject of many discussions with my supervisors. Watching these kids struggle with their identity and their place in the world has, like the horses, put me face to face with my own strengths, and more importantly, my limitations. Ironically, despite my initial misgivings about watching herd interactions, observation is one of my strengths. What doesn’t come easily, however, is getting obstinate teenagers to cooperate. Even numerous years as an HR director or actual experience as said teenager could not have prepared me for this. In my former career, I strived to avoid being the unsympathetic, heavy-handed authority figure that often gives the profession a bad name. But how does one get kids who want to jump off stall rails or spend sessions with their earbuds in to want go along? Further, how do I get them to love the equine experience as much as I do? I’m still working on the answer to the first question, but I’ve learned it begins with giving the respect you hope to get. The “because I said so” approach doesn’t cut it with kids who are often only present because another authority figure requires them to be there. For the second question, I can’t. I’ve learned that I can’t make them love equine experiences like I do, and further, it's not my place to do so. I can only be on hand to ensure their safety, to be present with them, and to let them know they matter. A more painful realization is that I cannot save these kids. Any of them. I can’t take away their hurts, and I cannot save them from making bad choices. That’s a hard observation to digest. The kid who still wants to use and is agonizing about returning home after multiple tries in rehab still wears on my heart. So does the socially awkward teen who is behind peers in the growth spurt. No matter how much I want to nurture these kids, stay with them and tell them that there’s better things ahead, I have to work within the confines of professional ethics. Maintaining professional distance wasn’t a problem in my corporate job, so why is it so hard now? My reflections have led me to this conclusion: Because the teenager that I used to be identifies with them. That wounded part of me that was the gangly, awkward, depressed, and painfully shy girl that I was at their age. I experienced that same awkwardness and latent development that makes teens feel isolated and so desperate to fit in. My heart hurts for these kids who come to MHP. But I have to check all of that the minute I step onto the property. I have to do my job and let the horses do theirs. They see and take in the same information that I do, yet they do it with with a grace and a compassion that I'm still reaching for. So I will continue to observe these horses as they interact with clients, with colleagues, and with me. I will watch them and look for what they can teach me from their interactions with humans. Nowadays, I'm more likely to ask with eagerness When is next herd observation? because after all, it is some of the most valuable work we do.